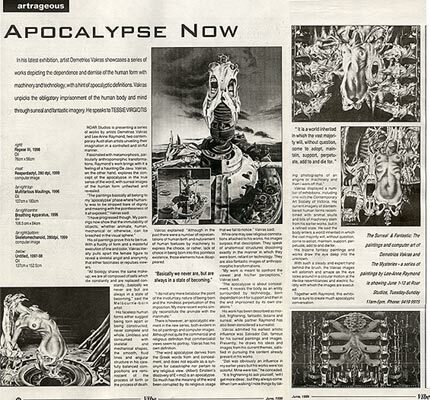 Digital images by Demetrios have also been showcased in the October 2001 edition of iTgraphicsmagazine.Right: the page featuring Vakras' digital images sekeletocompressor 2001, and ambiguity generator 2001. 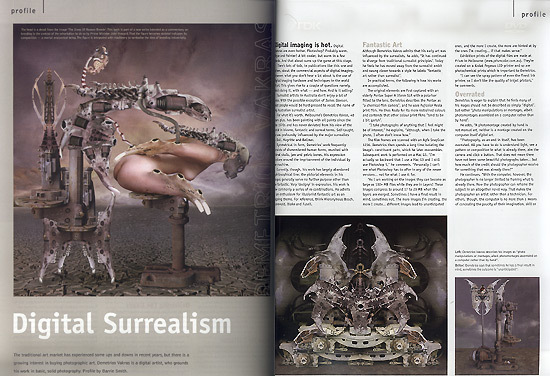 Demetrios' digital images were also reproduced in Digital photography design magazine, in the Autumn & Winter editions of 2001.Images reproduced - reaperdactyl, skeletised warmachine, & demolisher suspended -appeared as part of the "winning entries and [top] 100 images from the IDAA exhibition. " This was the inaugural International Digital Art Awards. 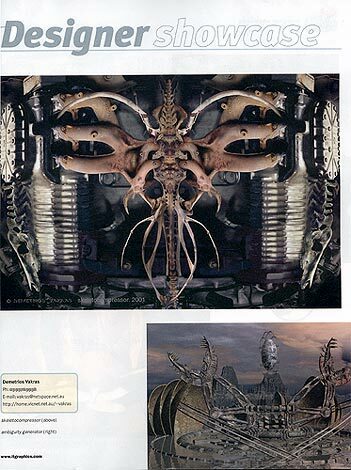 Another of Demetrios' digital images appeared in the Portfolio Edition of Digital Publishing Design Graphics, issue #78 January 2002. 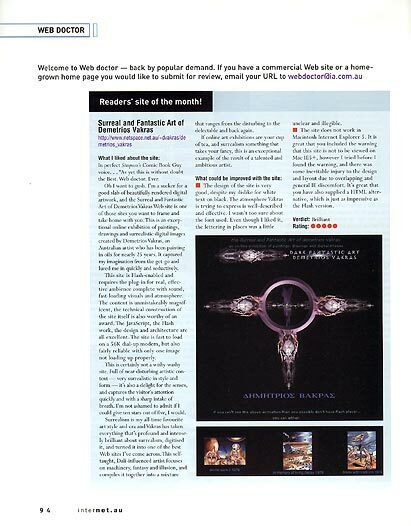 The webdoctor from INTERNET.AU magazine reviewed this site in a full-page review, issue 81/July 2002, p.94:"...this is without doubt the Best. Web doctor. 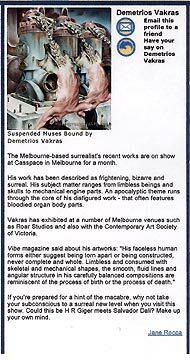 Ever....the surreal and Fantastic Art of Demetrios Vakras Web site is one of those sites you want to frame and take home with you. This is an exceptional online exhibition of paintings, drawings and surrealistic digital images...It captured my imagination from the get-go and lured me in quickly and seductively. ...The content is unmistakably magnificent, the technical construction of the site is also worthy of an award. ...the design and architecture are all excellent. 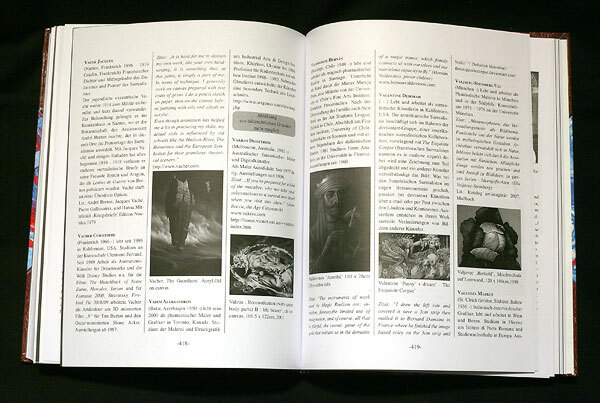 ...Full of near-disturbing artistic content - very surrealistic in style and form - it's also a delight for the senses and captures the visitor's attention quickly and with a sharp intake of breath. I'm not ashamed to admit it I could give ten stars out of five, I would." The joint exhibition "Amalgam" with Lee-Anne Raymond was reviewed by Jane Canaway of the Moonee Valley Community News.The article appeared on page 9 on the 23/4/2002. 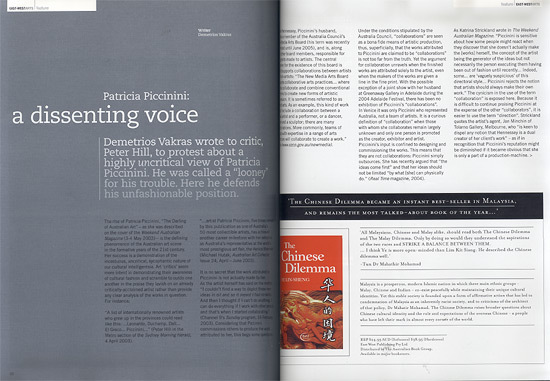 An article written by Demetrios critiquing the popularity of Patricia Piccinini was published in the inaugural issue of EastWest Arts. The article was not merely published, but was paid for (!) by the magazine. "Demetrios wrote to critic, Peter Hill [of the SMH], to protest about a highly uncritical review of Patricia Piccinini. He was called a 'looney' for his trouble. Here he defends his unfashionable position", John McDonald, editor. An article on Demetrios' digital images was published in ProPhoto magazine. 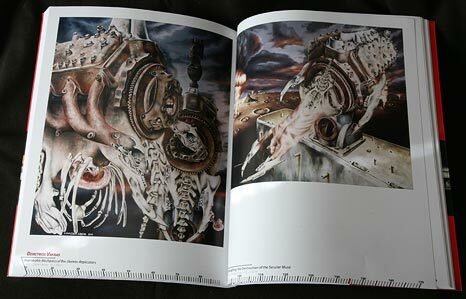 Two of Demetrios' paintings were included in the book Carnivora, The Dark Art of Automobiles, by Les Barany (best known as Giger's agent). 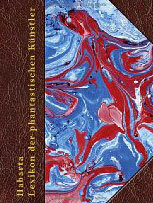 "Carnivora": The book by Les Barany is available on Amazon. 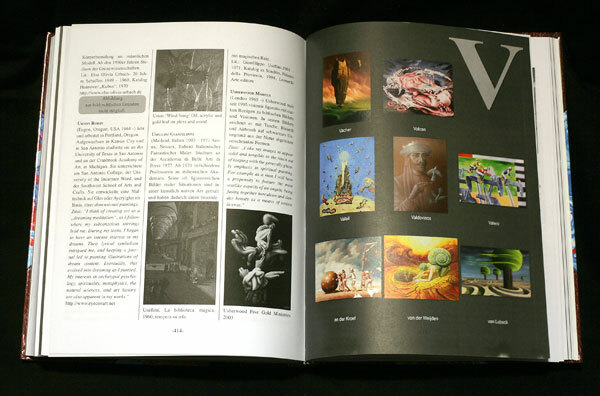 It features over 1100 artists of symbolism, fantastic art and surrealism! Included in their number is a small entry on my work (left). Though some fantasy art (kitsch), of the like produced by Frazetta, Vellejo and Brom, is included, the vast majority of works reproduced are of a very high quality! Though the image quality of the works reproduced in the book is not as good as it might have been it is well worth buying! 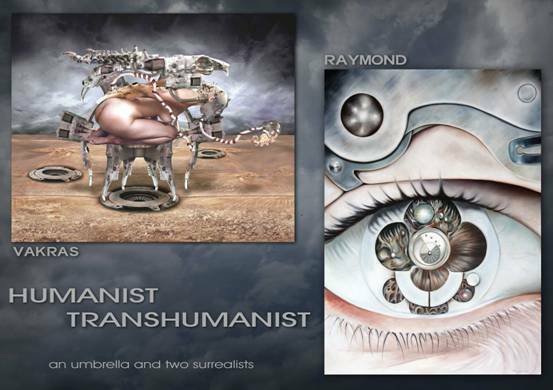 The exhibition Humanist Transhumanist (an umbrella and two surrealists) was held in 2009 at a then, recently-opened Melbourne gallery, "Guildford Lane Gallery" (which has since closed). It was a joint exhibition that featured both my art and that of Lee-Anne Raymond. The exhibition was turned into a disaster by the reactions of gallery owner, Robert Raymond Cripps, to an essay accompanying one of my paintings. This essay, critical of religious-based values, argues that we must arrive at our values by the application of reason. Cripps declared that this was racist because, included in the criticism of religion, was criticism of Islam. Somehow, Islam is not a religion? We were ordered out of the gallery on the opening night of our own exhibition. We wrote of this and of subsequent interactions with Cripps (vakras link / lee-anne link). Cripps decided that he would sue for defamation… We commenced proceedings against Cripps for breach of contract in the VCAT (state small-claims tribunal). The VCAT claim was eventually folded into the defamation case and the judicial orders for this were made available online by the Tribunal ( Australasian Legal Information Institute ). The article below, from the Melbourne Observer, references the information that had been made publicly available by the VCAT. 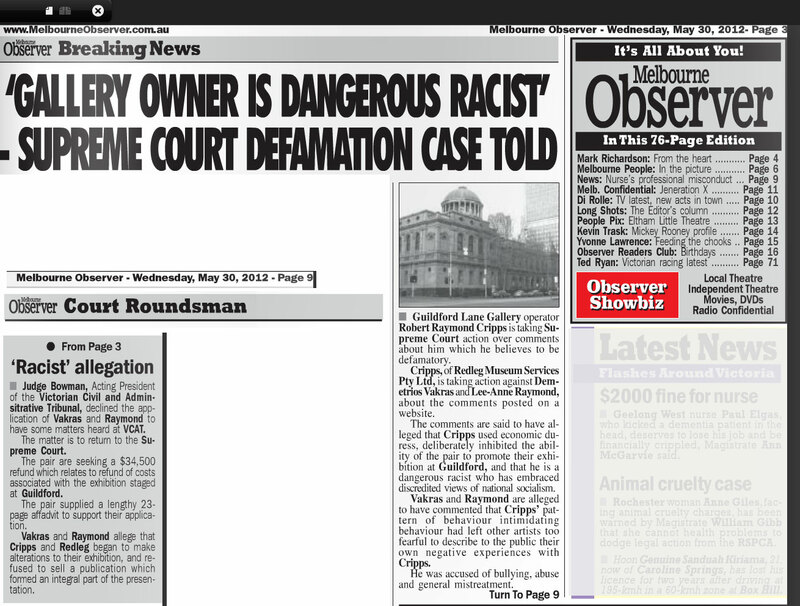 This article cites what might be taken to be legal threats against that paper by Cripps’ lawyer. It also however appears to us to be a convoluted threat by Cripps to apply for aggravated damages against us because someone else wrote about the matter! 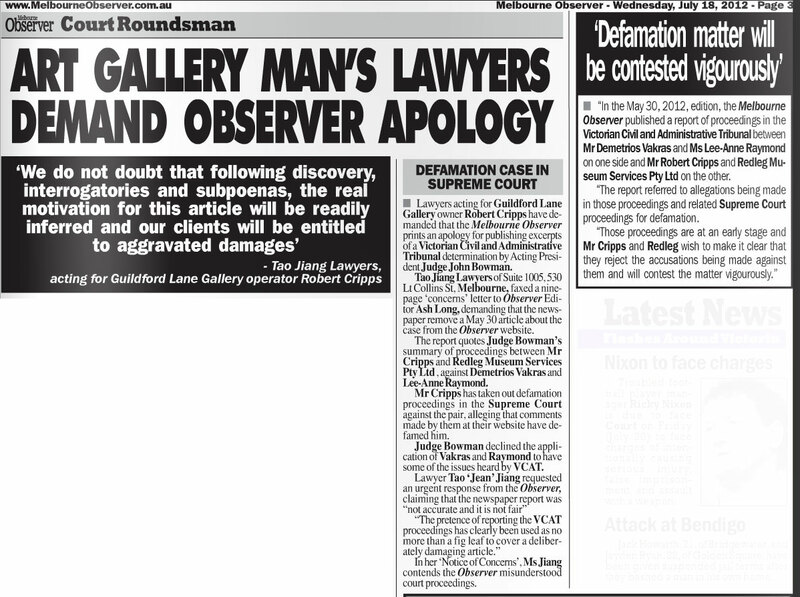 Above, Melbourne Observer, 30 May 2012, "'Racist' allegation" against "Guildford Lane Gallery operator"
Below, Melbourne Observer, 18 July 2012: Cripps "will [now] be entitled to aggravated damages"